The 1910 hay barn at DRA’s Great Salt Bay Farm was damaged beyond repair by recent wind storms. Breaks can be seen in four of the six upright supports of DRA’s hay barn, which are visibly leaning to one side. DAMARISCOTTA — Passers-by will notice a significant change to the landscape at Damariscotta River Association’s Great Salt Bay Farm. Structural damage to the barn caused by recent wind storms made it necessary to take down the 1910 hay barn across the road from the farmhouse on Nov. 20. 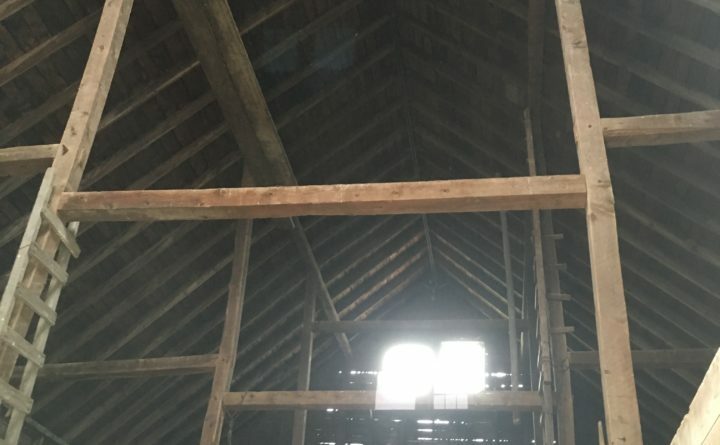 Though DRA had made repairs to the barn over the years, including a new roof, cribbing, and substantial bracing, the structural timbers were compromised by the 70 mph winds of the Oct. 30 storm, as well as by the two subsequent gales. Four of the major vertical posts sheared completely so that the barn began to shift and then to sway in the wind. 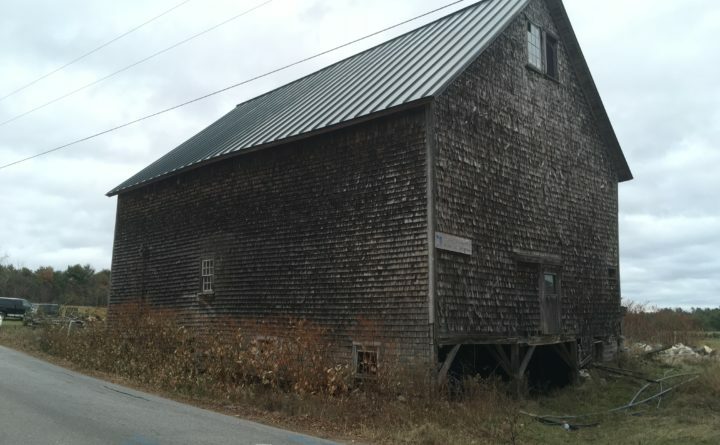 The barn was not a true post and beam with rugged old timbers, but a lightly-built transitional type, straddling stick built and an older type of construction. Given its proximity to the road and power lines, literally feet away, and the high likelihood of imminent collapse, DRA was advised to act immediately to remove the danger. Safety was ultimately the primary consideration in the decision to have the barn taken down. DRA hopes to build another barn eventually for its working farm, one that reflects the history and tradition of the area. For now, DRA is mourning the loss of a beloved landmark. Damariscotta River Association is a non-profit, membership supported, and nationally accredited land trust and conservation organization dedicated to preserving and promoting the natural, cultural, and historical heritage of the Damariscotta region, centered on the Damariscotta River. DRA has active programs in the areas of land conservation, stewardship, community education, water quality monitoring, marine conservation and cultural preservation. For information email dra@damariscottariver.org, or visit www.damariscottariver.org.